Continuing our look at the Clackamas County Cultural Resource Inventory, we travel down the Trolley Trail to 4001 SE Roethe Road. On the site, there once stood a flour mill. The machinery, built in 1879 was imported from Muncie, Indiana. It was a full functioning mill until the mid-1980s, when it burned down. The name Moore’s Flour Mill, might ring a bell, however. The owner of the mill in the mid-80s, was Bob Moore. After the fire, the company relocated to International in Milwaukie. “I told Charlee, ‘you know, it’s crazy, but I think that’s an old mill.’ I could see the grinders and mixers; it had been closed for years,” says Bob. He later learned that a rail line used to carry grains to the mill, and when it was pulled out in 1957, there was no longer an easy way to deliver grains there, so it closed. Bob and Charlee made a decision to purchase the mill, and Bob’s Red Mill was born. They started with 11 employees, making 100 different products, including 10-grain cereal and cornmeal. 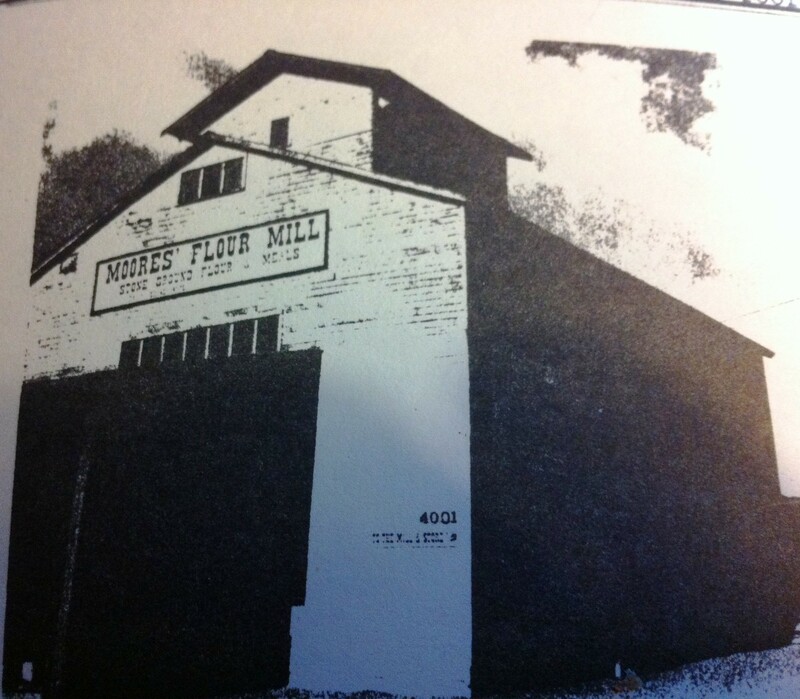 The mill represents our agricultural past and at time was the last remaining working mill in the Oak Grove and Milwaukie area – until the new Bob’s was built. Posted in Oak Grove, Oregon, Oregon History, Oregon Main Streets, Oregon Roadside, Portland History. As one that was born on Roethe in 1949, I gotta say that calling this flour mill part of Oak Grove really stretches some boundaries. Technically, it is far closer to the several platts that comprise the Jennings Lodge (expanded) platt; just a couple of hundred yards farther south. Oak Grove is two miles North, and, if one attended the local Concord grade schools, then Oak Grove was the enemy. This went away with the opening of Rex Putnam in 1963, where Concord and Oak Grove came together. But personally, I have never considered Roethe part of Oak Grove. Past that I remember the mill, the trolley when it was running, and then the fire of the mill. I’v got three generations of Whittingtons from the 40’s just blocks away on Broadman St.. They had the Peter Pan Ice Cream shop there in Jennings Lodge. May have some realitives who worked this mill. Any thing you can dig up on Peter Pan would be great. My grandpa Ed Whittington once captured two excaped cons at the store with an emtey shot gun… Have the Oregonion artical somewhere. His room mate at the University Doc Faucet took Sid to his home in the Portland area and it was here that Sid met the love of his life Dorothy Whittington horse back riding. This is great. Thank-you so much for getting back to me. I’ll email you soon. Happen to be in Canby Just down the road from Jennings lodge. Here for the week doing some exploring with my daughter. I found one picture of Esther, Ed’s wife, holding a peter pan ice cream can. I’ll send it. The Peter Pan Nickel Stick ice cream was the absolute best!! I remember going to the mill with my mom as a kid. i loved it as they always had samples out and i loved the creaky floor boards and remember it being quite dark inside and the shelves being stocked with the wares of Bob and his mill. i it was a great place and i remember being very upset when my mom told me that someone burnt it down. it was a great place and one of my cherished childhood memories. Current info. on Triangle Portland neglects to mention people food like oatmeal (earlier) and Triangle Old Fashioned Whole Wheat Flour (in plastc bags). One obit came up for a guy in Harrisburg said to be responsible for bringing milling to that area in 1862. Bet that would make some stale bisquits. Previous Post Lost: Church in Oak Grove, Ore.